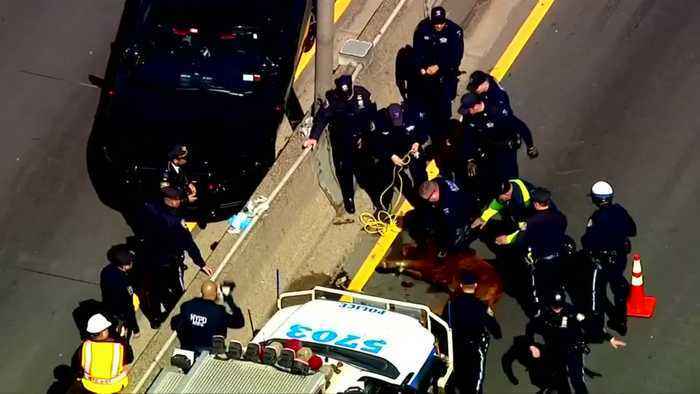 A calf on the loose slowed traffic on New York's Major Deegan Expressway in the Bronx on Tuesday, where it was eventually captured, local media reported. ROUGH CUT (NO REPORTER NARRATION) A steer slowed traffic on the Major Deegan Expressway at midday on Tuesday before New York police officers could wrangle the bovine runaway. Traffic piled up for about an hour before it could be removed from the expressway. Local media reported the cow would be taken to Skylands Animal Sanctuary and Rescue in New Jersey. The calf has since been named 'Major Deegan', local media reported. It is unclear from where the animal escaped.